As a lime plaster and insulation expert, I often come across the misconception that lime as a building material is somehow old-fashioned but, in actual fact, lime is one of the very best substances you can use today. It’s flexible, breathable, reduces condensation, is easy to work with, is affordable and, as a bonus, it’s beautiful too! If you’re wondering if lime is for you, whether you’re renovating your own house, working on a new build or simply exploring options, here are my top 10 reasons why you should give lime a go. In other words air can pass through it in a way that doesn’t happen with a denser material like cement, or polymer-based renders and plasters. Why is this important? Well, it basically allows buildings to breathe, so that when moisture forms it can escape. And that’s important because moisture – effectively water – is the enemy of natural materials like stone, timber and iron. If you’re looking to retain structural integrity and protect your building, lime plaster should be your first choice. This means it can effectively act as a natural humidity control, taking out moisture from the air when there’s too much, and releasing it back when the air gets too dry, all of which makes for healthier and more pleasant living conditions. No condensation – healthier for you and your home! When you use lime plaster or mortar for building, you won’t get condensation on the surface of walls. Lime has disinfectant qualities, especially when it’s used as limewash, but the same is also true for lime mortars, plasters and renders. This means it will resist the build up of moulds that can lead to breathing difficulties, creating a healthier living environment, and making lime plaster an ideal material for building particularly if you or members of your family have any respiratory problems such as asthma. One of the key properties of lime is that it is made of very fine particles, much smaller than those that make up cement – in other words, this makes it very sticky’ which allows it to penetrate into the tiny spaces on the surface of other materials, binding to them extraordinarily well and making it both strong and long lasting. Lime surfaces and materials can actually become stronger over time through the formation of calcite crystals that form in lime-rich environments,. For evidence of the enduring properties of lime check out Rome’s Pantheon Temple whose lime concrete dome not only spans an impressive 43 metres but was built nearly 2,000 years ago! Lime plaster is flexible and more forgiving! As lime is a ‘flexible’ building material that gives a little when a building moves or shifts, it’s far more forgiving than more brittle materials like cement which may crack or deform even with just a very little ground movement or swell. A great material to work with, lime mortars and plasters stay smooth and malleable, even against the suction from porous brick and block. This ‘workability’ helps greatly in ensuring that bonds are good, essential for good workmanship. What’s more, this workability also means that variously graded aggregate can be added to the lime mix to further improve performance and create different looks for your perfect finish! Because lime binds well with many things, recycled material such as glass can be easily incorporated into it, just as we’ve done at Lime Green with our Ultra range of insulating lime plasters and lime renders, which contain recycled glass beads. 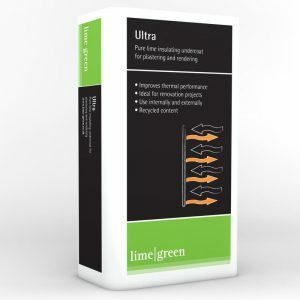 Lime also heals itself – while movement in cement-bound buildings tends to result in cracks, the same movement in buildings where lime is used produces many fine cracks. When water penetrates these, it dissolves any ‘free’ lime it encounters, depositing it there as it evaporates. In this way, lime seals and heals. Lime is perfect for creating an unobtrusive finish that blends naturally into a locality in a way that is difficult with more contemporary products. This can be important when you are trying to meet local planning requirements, or to create a look sympathetic to a local identity. Lime as a surface finish is aesthetically pleasing, with a more ‘natural’ look that comes from the double refraction of light through the calcite crystals that are present in it. This creates a softer texture than you get with ‘harder’ cement-based products, which can complement the appearance of either contemporary or traditional buildings. With lime plaster and render, you also get a visually unique finish each time with the surface quickly developing a distinctive ‘patina’ that has a translucent glow, something that’s seen for instance on the beautiful buildings in Venice. So, if you weren’t already thinking about using lime building materials for your next project, hopefully I’ve convinced you to think again! Previous Post FHL: What is a Furnished Holiday Letting?